This Paella with Lobster is perfect for a fancy dinner or celebration. When it comes to Lobster, it must be high quality and very fresh. This kind of ingredients are better found on a fish market where you know the product is very fresh from the same day. 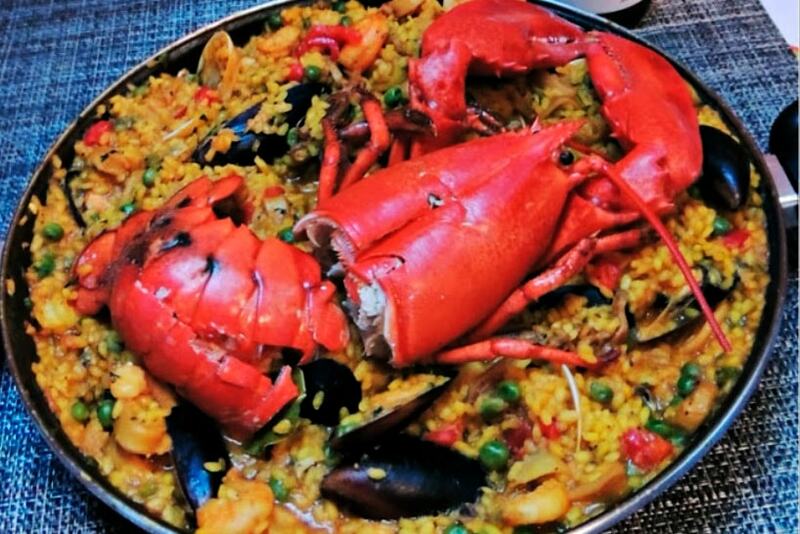 Although the taste of lobster would be enough to give great flavor to this paella I also wanted to put prawns and clams because if it does not have a little bit of everything, is not a real paella. For the original Spanish seafood paella recipe and other recipes go our home page! Cut the lobster in half and separate the body from the legs. Put the clams in a container full of water and with a handful of salt to clean them. To start, pour the oil in a paella pan over medium heat. Add the chopped onion and poach for a few minutes, until it is translucent. Next, add the chopped lobster and let it fry for several minutes until it has a pinkish color. Once it is half done, take it out and set aside. To start with the sofrito, add the chopped tomatoes, previously blanched and peeled, the bay leaf, and the saffron. Stir everything together. Now that the sofrito has thickened, add the rice so that it is sautéed and absorbs all the flavors. When the rice has picked up a little color, pour in the broth that we have previously heated, season it with salt and stir it again so that it is evenly distributed. Next place the lobster on top, with the head on the side of the body and the tweezers on the sides. Then let it cook over high heat until it starts to boil, and when it boils, lower it to a medium temperature. Leave it like this for 10 minutes. After that time, add the peas, the drained clams and the peeled prawns on top. Let it cook for at least 5 more minutes. Everything will depend on the amount of water we have left and the texture of the rice. If necessary, pour more stock to continue cooking until it is al dente. By that time, the clams should have opened, the prawns will have been cooked correctly and the lobster too. To finish, turn off the heat and let it rest for 5 minutes before serving. Y listo! As you can see every Paella is made in a very similar way, we just have to change a few things depending on the ingredients. Hope you like this Paella with Lobster, Chao!